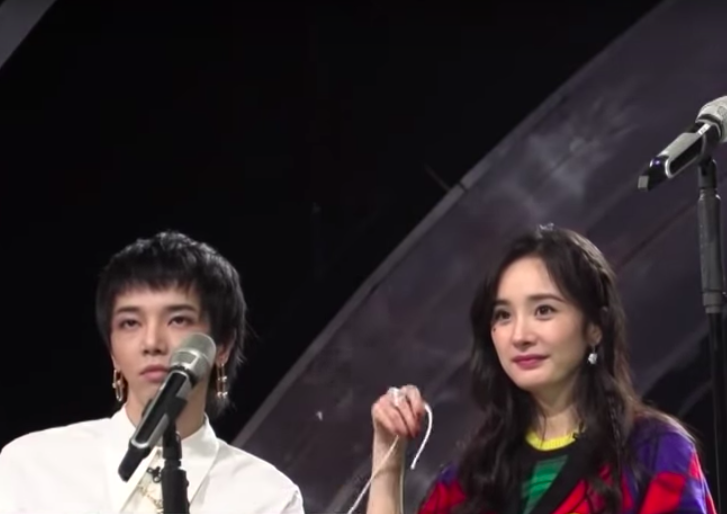 The Coming One 2 明日之子2 filmed its final competition on the 14th September in Beijing with Yang Mi, Hua Chenyu, Li Yuchun and Qing Feng sitting on the official panel. 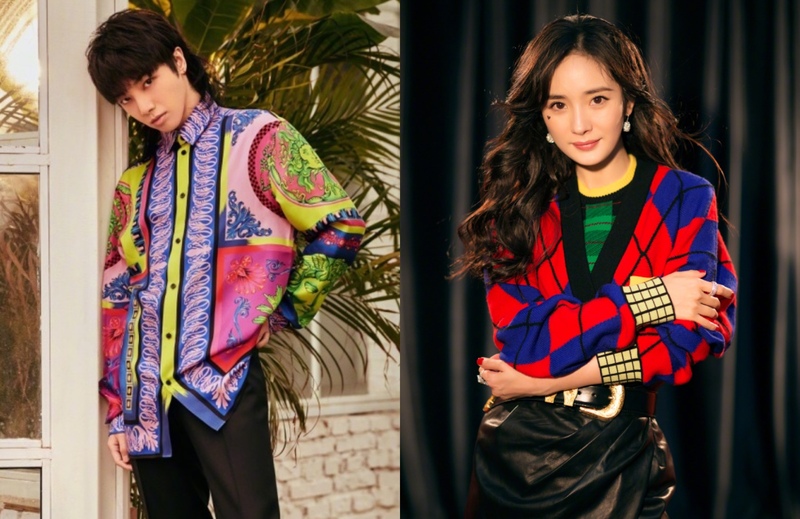 During filming, Yang Mi was seen playfully tinkering popular singer Hua Chenyu's clothes. What was hopefully an adorable and playful behavior turned into a cause for debate. 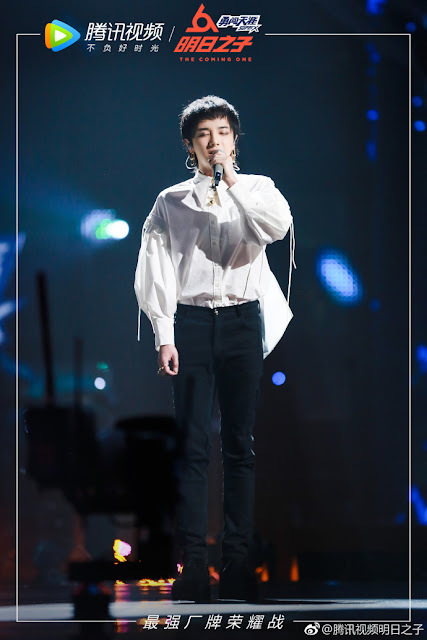 Hua Chenyu was wearing a white shirt with two strings on either side. Yang Mi who sat beside him kept on grabbing the two strings, pulling, tugging and wrapping it around her fingers. A fan of Hua Chenyu was clearly not happy and shouted for her to let go which generate some laughter from the audience. She stopped for a bit but continued to play with Hua Chenyu's clothes. Netizen have criticized Yang Mi, who is a married woman, for flirting with another man, claiming that it would have been a lot different if it were the other way around such that Hua Chenyu was a woman and Yang Mi was a married man. Others have come to Yang Mi's defense saying that the two have a good relationship and often joke around each other. Someone even saw Hua Chenyu playing with the strings himself so I guess it can't be helped! My take on this is that if they are friends, there shouldn't be an issue and if it really bothered him, Hua Chenyu is big enough to say so himself. If he didn't say anything then I guess it didn't bother him so why should anyone be bothered? I also doubt that Yang Mi would have continued to bother him if Hua Chenyu told her to stop. For me, this is a none issue and it's simply something you do with really good friends. She doesn't have interactions. She is arrogant. because woman hate other woman.. I think it’s because her relationship with her husband has been on the rocks, so her behavior would lead to more problems. Yang Mi has always been extremely friendly with her male friends. If she wasn’t so popular, she would have had negative rumors from the start. This time, it was the fan who was unhappy with her behavior, which is reasonable. Had it been another female artist like Yang Zi or Dilreba, those two would have been labeled as flirting by everybody. I think that it just Yang Mj’s nature. It’s an open relationship with her husband, so she has no restrictions with her personal life. So it's reasonable to accuse her to flirt when she is just being her natural playful self because she might have problem with her husband? So women who have problem with their husbands or have husbands cheating on them should stay home and keep distance and has no interaction with all males? Because people like you would call them flirts? But then people would call her arrogant for acting all cold and has no interaction. There is no way she can win. And I honestly believe one of the reasons she doesn't announce her divorce is it's true to avoid gossips. People, antis, media love to created gossip between her and her costars even most costars said she is more easy going than all the guys. If she announced she divorce they would have no limit and everything is much worse. Like she didn't have close interaction with Ethan and yet people tried to said they have an affair when the drama started too. ^ Please...watch BTS and you’ll see Yang Mi flirting with Ethan. There are different ways to flirt. Constantly trolling someone is attention grabber. I guess you don't know Yangmi. She playfully put flower on Zhou Bibi,HXM HCY's heads etc on an award night last year. She is clingy and playful with people she is close with. And to most male costars like Mark, Chang Chen said her personality is like boy because how easy going and independent she is. HCY and Wallace said she is hateful and annoying because she love to joke and troll everyone. That's how she is, playful and easy going. But people who don't know her it's flirting? Like why would she flirt in front of camera and hundred of peoples. Do you think Yangmi stupid? I feel that you have been putting negative views often like from the fanwar and recent jaywalk new artist company. I could be wrong but you are giving me this impression. You think this is flirting and that's why it's ok for his obsessed fan to cursed her? I hope this will never happen. But if one day YM lost her control and gave up this tiring and bully life, everyone of you is the one that pointed the gun to her head and I hope each one of you would live with the regret forever. People need to think more before they talk or behave. AndreaK, I totally agree with you. Twirling someone's clothing is definitely flirting, even if it's only done as a joke. And she can do it if she wants, especially since we all know she's only staying married to Hawick Lau in name, for the sake of the image. Don't worry about the zealous Yang Mi fans. You made an absolutely ordinary, valid observation. Flirting is flirting is flirting. That's what she did, and so what if she did? I also find it ironic that Yang Mi fans point out that others don't personally know Yang Mi, as if they do. Your definition of flirting is really funny. Have you seen the show itself? It's just yang mi being playful. How should you judge someone when you said yourself you don't know her. Of course Yang Mi's fans don't really know her but they obviously know her better than you or others who just want to judge her as if you really know her. Maybe if you stop judging people you'll see this world better. Just saying. Yang Mi fans are so defensive it's hilarious. I guess in your world it's normal to just start playing with people's clothes? If so, I highly suggest you start trying that on your co-workers and see how they react, just for the fun of it. Your definition of flirting has got to be way funnier than mine! Also, I don't see how it's judgemental to point out flirting when you see it. She can flirt as much as she wants. So just to please the Yang Mi fans who like to deny everything and to paint their goddess in a hue of golden purity, we'll call it not-flirting then. Yang Mi also has the most perfect relationship with Hawick Lau. No problems whatsoever. The sun is also not yellow. lol. Yang Mi's fans are the most hilarious. And you are the most righteous.See it's rhimes. When Yang Mi's fans defended her, you said that we did it as if we knew her so well. But then you judge her as if you know her so well. It's a string, far enough from the person who wears it. If let's say someone plays with a person's collar and touch the skin, then I'll say it's flirting. The sun is orange. Don't you know it? I didn't say anything aboit her marriage. Why would yoi bring it up? Are you Yang Mi? How should you know how her marriage is. Perfect? Nobody's marriage is perfect. Don't be ridiculous. Everybody knows that Yang Mi is not perfect and she's not a goddess. Nobody is perfect. You should know that simple fact. And there is no goddess in this world cause we don't live in heaven. Oh no, I feel myself getting sucked into the land of illogical reasoning, really bad spelling, and now even worse—RHYMING—with the Yang Mi fans. What did I ever do in this life to deserve such rhymes? I’m glad that the person who said “that's how she is, playful and easy going” recognizes that they don’t actually know Yang Mi personally. People need to stop acting as if flirting is some sort of a sexual transgression. It’s not. It even happens with people who are happily married and devoted. And you don’t even need skin contact to flirt with someone. Flirting is a behavior that is defined by its playfulness, affection, and/or teasing. Yang Mi definitely flirts; and obviously a whole bunch of people on here recognize flirting when they see it. But if it makes you happy, go ahead and deny or twist it however you like. But maybe we should talk about a less controversial and earth-shattering subject, like maybe Yang Mi’s really mediocre/bad acting skills and how she can improve? Your response, attack and comment about me personally are way out of line. This is a blog, please be more respectful. how do you expect people to respect you when you don't even respect others? I feel you, Andrea K. Don't take it to heart. The Yang Mi fans are on a whole other level of illogical defensiveness and attacking. You can't even state facts, much less criticize their idol. I just ignore the fanaticism, and carry on with comments. lol. to me it's inappropriate - Yang Mi is in a position of power - the young guy risks something to speak out to her to stop. She should just respect other people's space. Being "playful" is an excuse used all to often by people in power.